U.S. stocks flipped between small daily gains and losses before ending the week fractionally lower as markets proved resilient amid rising geopolitical tensions. Bond prices advanced for a fourth week and gold and oil futures rallied after the U.S. launched a cruise missile strike against a Syrian air base. President Trump said the base had been used for planes involved in a chemical weapons attack which killed dozens of Syrian civilians earlier in the week. The attack escalated America’s role in Syria and drew criticism from Syrian President Bashar al-Assad and his allies, including Russia and Iran. Also causing Wall Street angst, just 98,000 new jobs were created in March, the fewest since May 2016 and was just half the level projected by Wall Street economists. It was noted that the soft U.S. payrolls report was, in large part, due to disruptions from March winter storm Stella that dumped 10” - 20” of snow in the upper Midwest and Northeast. For the week, the S&P 500 fell -0.24%, the Dow Industrials dipped -0.03%, and the MSCI EAFE (developed international) slipped -0.66%. Investors awoke last Friday to the startling news that the U.S. had bombed a Syrian military airbase in retribution for the chemical gas attack on its own people. Ahead of the opening bell, futures pointed to steep declines, and early trading sent the S&P 500 down nearly 3%. So yet again— as has been the case for bull-market shocks since WWII— investors sold first and asked questions later. As more news reports clarified the situation, initial fears evolved, and cooler-headed concerns turned to questions like “will this event escalate and ultimately lead to a recession?” And since the consensus view was “likely not,” investors began buying back in, paring sharp early morning declines on the S&P 500 to only 0.08% by the end of the day. 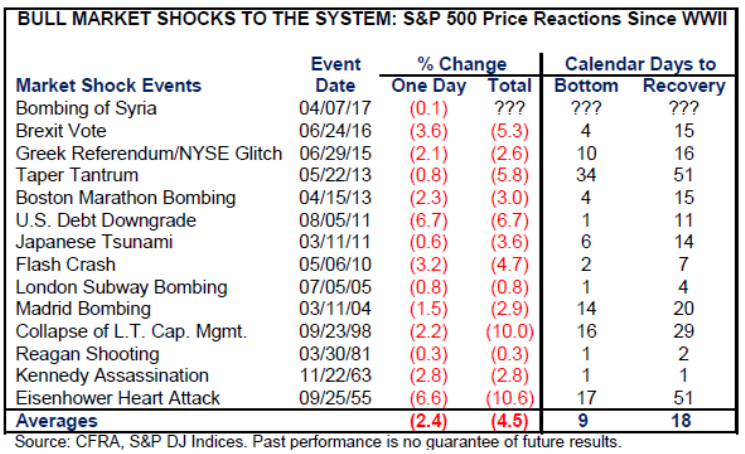 As Chart 1 illustrates, in 13 bull-market shocks since WWII, the S&P 500 fell an average 2.4% on the day of the shock, and slipped a total of 4.5% before bottoming out only nine calendar days later and getting back to breakeven in 18 days. This time around, the recovery could be a lot quicker as investors re-focus on a more imminent issue of interest: the start of the first quarter 2017 earnings reporting season, which currently points to overall S&P 500 earnings improvement just below 10%.